Since our last blog, Agung has had two months to reflect and has recently begun a strong ash venting process, with incandescence visible at night in the summit. 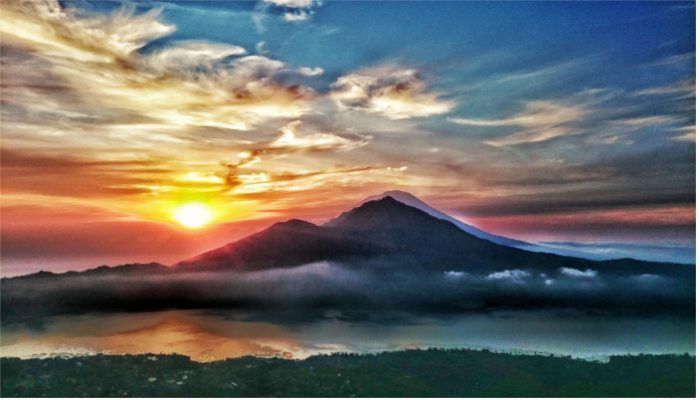 Updates from Magma Indonesia, the official communications hub for natural hazards in Indonesia, have highlighted an elevated level of volcanic tremor and an evacuation zone to 12 km radius around the volcano is being enforced. 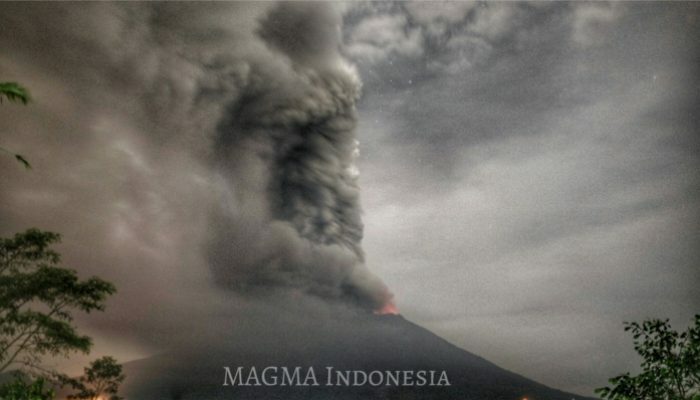 You can follow Magma Indonesia on twitter, and see regular updates on Agung. To the frustration of anyone wishing to fly in or out of Bali, the ash emissions are heading southwest, towards Bali airport, and so the Indonesian authorities have closed the airport as a preventative measure.On 29th November this restriction was lifted as the prevailing wind was no longer transporting ash towards the airport. The ash plume is rising to only to 3 km above Agung, which is 6 km above sea level. This is the height where jet aircraft are climbing to cruising altitude with a full fuel load, and so are particularly vulnerable to engine failure due to ash ingestion. There is a possibility to take a ferry to Lombok and fly from there. Rinjani volcano on Lombok erupted last year, resulting in a closure to airspace, but fortunately Rinjani seems to be quiet now. There have been reports of people refusing to leave the evacuated area around Agung. It is always best to follow the instructions of the local authorities during an eruption. The Indonesian volcano evacuations have been very successful in recent years with many thousands saved in a series of timely evacuations from Merapi during its eruption in 2010. Ash from the Agung eruption is collected by the Indonesian volcano monitoring authorities. 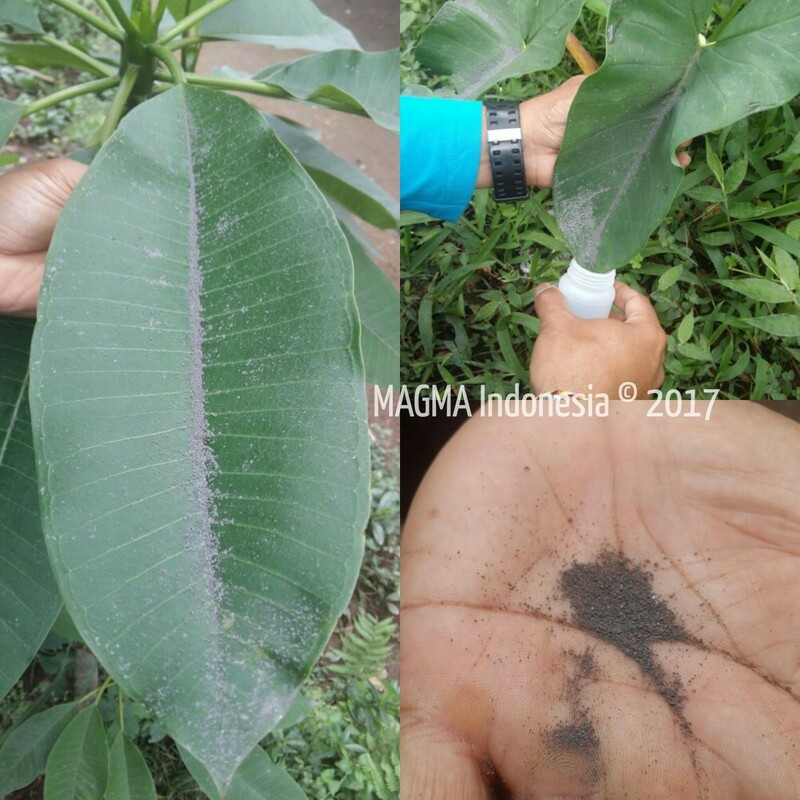 Image from Magma Indonesia. The pattern of activity we have seen to date allows for a direct comparison with that observed during the first days of the 1963 eruption, as reported by Self and Rampino . Then, there were two days of felt seismic activity followed by explosive activity, associated with a lava emission which eventually produced a 7.5 km long lava flow (after 26 days). 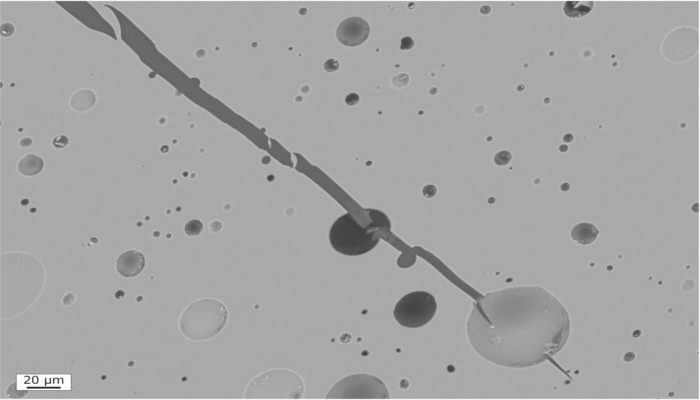 The explosive activity produced ash and incandescent material that was ejected to 6 km above the craters. Pyroclastic flows, generated either from the collapsing front of the lava flows or the explosive activity, were visible running down canyons on the north and south flanks. After nearly a month of this activity the eruption ramped up to a significant explosion, generating a plume to 19-26 km altitude above sea level. A further tall eruption column was formed during an explosion ~2 months later, and then mild explosions and lahars continued for several months, before the eruption ended. Comparing with the current activity, it appears that the 1963 eruption was a lot more energetic in its onset. The incandescent ash venting for some days now has not yet led to a more explosive phase and there is no sign yet of a lava flow. However, the transition could be such that pyroclastic flows appear with little to no warning, hence we must stress the importance of adhering to the evacuation procedures. However, this could change quickly, and the transition could be such that pyroclastic flows appear with insufficient time to escape for anyone within the evacuation zone. How the eruption will develop from here is hard to judge. The most likely evolution would be towards a lava effusion as in 1963, but there could be a sudden transition to explosive activity or, whilst lower probability, cessation of activity. 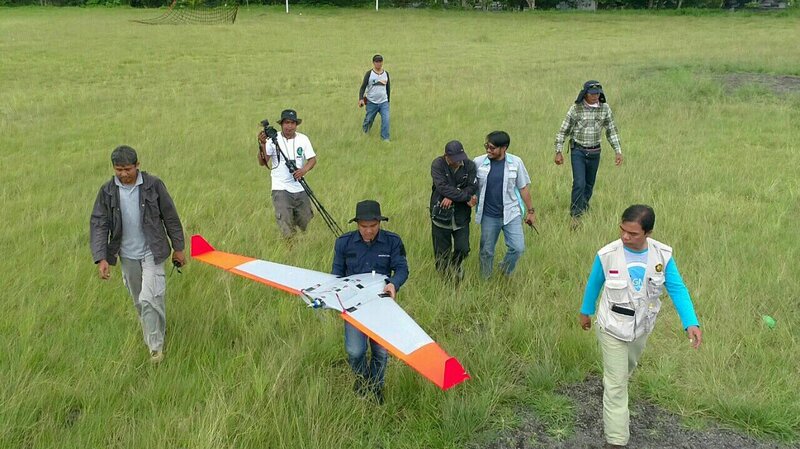 While the activity is very disruptive for local populations and the economy of Bali due to the impact on tourism of airspace closures, this does afford volcanologists with the opportunity to use the new modern techniques to track the eruption and hopefully gain a better insight into the processes which drive the activity. In this way we will progress towards a better understanding of the relationship between the signals that the volcano produces and the imminent activity, allowing better eruption forecasts. We will update this blog as the eruption evolves. Novel plume monitoring techniques are being employed by Magma Indonesia. Blog written by Mike Burton, GMPV President (gmpv@egu.eu), and the GMPV science officer team. Agung volcano, a 3.1 km high cone located in the east of Bali, Indonesia, which last erupted in 1963 killing ~1500 people (Self and Rampino, 2012), is currently undergoing seismic unrest, and steam/gas emissions have been observed at the surface. 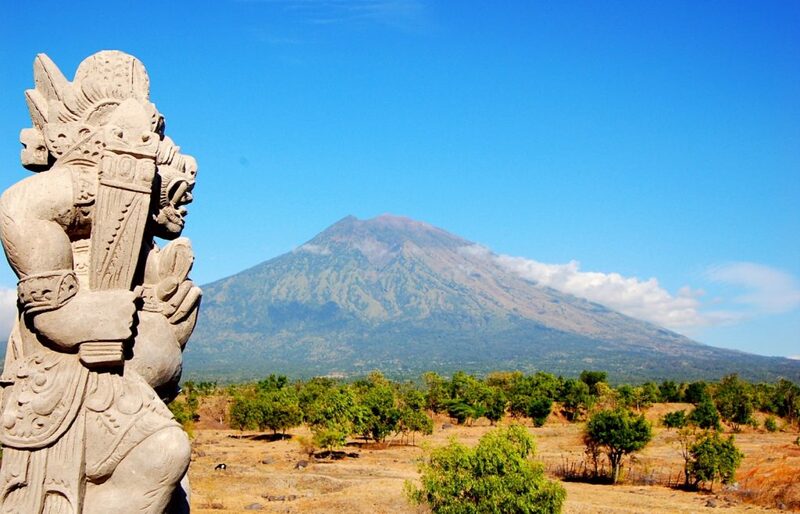 This has led the Indonesian authorities to evacuate areas around Agung which could be affected by volcanic hazards, leading to the displacement of over 75,000 people. The most likely cause of this unrest is the injection of hot, fluid magma called basalt into a cooler more viscous magma called andesite, as proposed by Self and Rampino (2012) to explain the onset of the 1963 eruption. When the basalt interacts with the cooler andesite it leads to a series of dynamical processes that release volatiles (primarily H2O, SO2 and CO2) at the surface and pressurize the magma plumbing system, resulting in strain producing seismic energy release. 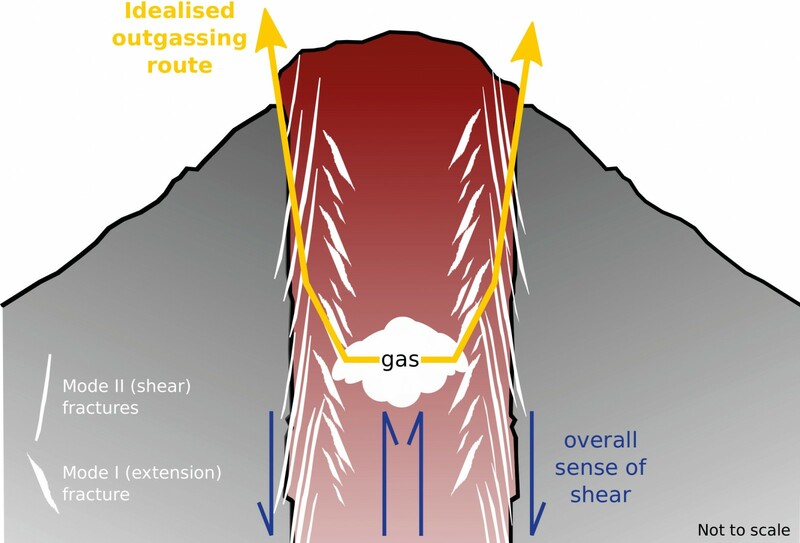 Whether this leads to eruption or not depends on whether the pressure in the magma chamber can exceed the confining pressure, and produce a magma ascent to the surface. No one knows if this will happen in the next few days, but it easily could, and sooner or later there will be an eruption. The decision by the Indonesian authorities to evacuate was clearly sensible, and it appears that the local populations have been well informed on the dangers posed by Agung, helped by the living memory of the events in 1963/64. However, the normal pattern of events leading to eruption is often an exponential increasing seismic energy release, and the most recent data appear to suggest that after an initial acceleration in seismicity the system is now is a quasi-steady state, which could change very rapidly. In some ways, the best course of events would be the for the eruption to begin soon, while the alert is at maximum level and most people in potential danger have been evacuated. If there is now a pause of days/weeks without activity, there will be a growing pressure by local populations to reoccupy evacuated zones, increasing the vulnerability in case of a sudden eruption onset. Such challenges are, sadly, a fact of life for people world-wide living in the shadow of active volcanoes, and while our research makes progress in understanding the processes driving volcanic activity, we are still far from being able to provide deterministic forecasts of future eruptions. The main hazards posed by Agung are pyroclastic flows and lahars. Pyroclastic flows have two main causes. The first cause of pyroclastic flows is the collapse of lava accumulating in the summit area, which produces a hot rock avalanche, entraining cooler air and accelerating as it flows down the flanks of the volcano. These flows can extend for several km from the summit. The second source of pyroclastic flows is eruption column collapse, when a volcanic explosion erupts a large volume of rock into the atmosphere, which then falls back down around the summit area, producing hot rock avalanches again, but this time with greater energy. This was the dominant source of pyroclastic flows in the last, 1963 eruption of Agung, producing flows to ~10 km distance from the summit, primarily to the NNE, but also to the SSW and SE. The total volume of lava and tephra (fragmented rocks in the eruption column) erupted during the 1963 eruption was ~1 km3, over a period of just under a year (Self and Rampino, 2012). Lahars are flows of mud and volcanic ash, which can be easily mobilised when freshly deposited ash is carried by the intense rains in the Indonesian rainy season. The most intense rains usually occur between November to March, so an eruption in the coming weeks could lead to lahars quite quickly. These mud flows are extremely hazardous as they can flow quickly and for long distances, scouring the land and damaging infrastructure, as well as posing a threat to life. The probability of a large number deaths and injuries is much lower now than it was in 1963, as modern volcano monitoring techniques have improved, there is much better awareness of the hazards posed by explosive eruptions and, most importantly, local populations are better informed, with clearer communication links. About 25% of eruptions from Agung are of slightly larger magnitude (Fontijn et al., 2015), with the last eruption before 1963 occurring in 1843, producing eruption deposits approximately twice that of 1963. There have been three other, similar magnitude eruptions over the last 5000 years, but no indication of anything significantly larger. There are numerous smaller eruptions observed in the stratigraphic record. Therefore, planning for a scenario similar to the 1963 eruption with pyroclastic flow run out up to 12 km from the summit is prudent, with a good probability that the actual eruption will be smaller than that. The north-east flank of Agung Volcano seen in 2009. Credit: Antoine Vasse Nicolas. Apart from the local impact, an explosive eruption from Agung could affect air traffic through the dispersal of ash into the atmosphere, and climate, through the injection of SO2 and HCl into the stratosphere. The numerous active volcanoes in Indonesia produce explosive eruption that quite frequently disrupt air traffic, with the most recent events including the closure of Lombok’s Praya Airport in August 2016 due to the eruption of Rinjani volcano. The eruption of Raung in July 2015 led to the closure of airspace over Java, Sinabung in 2014/2015 affected Sumatra and Kelut effected aviation in Java in 2014. The danger posed by ash to aircraft is that the ash melts within the jet engine, and then accumulates and solidifies on a cooler rotor, eventually blocking the engine entirely. This occurred in June 1982 on a British Airways flight from Malaysia to Australia, which flew through the eruption cloud from Galunggung volcano, Java, resulting in engine failure of all four engines of the 747 jet. After numerous attempts the pilot was able to restart the engines, and the plane landed safely. The injection of SO2 high into the atmosphere can produce climatic impacts through the generation of sulphuric acid aerosol droplets which reflect solar radiation, cooling the surface of our planet. The 1991 eruption of Mt Pinatubo in the Philippines is the most well-known example of this, producing a global cooling of 0.5 C after erupting ~18 Mt SO2 (Guo et al., 2004). The 1963 eruption of Agung erupted ~7 Mt of SO2 into the stratosphere (Self and King, 1996), and would have slightly affected climate. Stratospheric injection of HCl can produce ozone depletion, but the humid conditions of Indonesia means that the bulk of erupted HCl will be rained out. In conclusion, the current unrest on Agung may well lead to an eruption, and it will be closely monitored by the Indonesian authorities, who have already taken preventative action by evacuating local populations. This unrest is being followed attentively by many people on twitter and other internet sources, with continuous live updates, so any change in activity will be known worldwide within minutes. In parallel with the activity at Agung, there is also an evacuation of 11,000 people from Ambae island, Vanuatu, due to the threat posed by an eruption from Manaro Voui volcano. This important event will be the subject of a future blog post by the GMPV Science team. Blog written by Mike Burton, GMPV President (gmpv@egu.eu), with comments from Olivier Bachmann, (Scientific Officer of the GMPV Division). The last decade has been inundated with reports of environmental disasters impacting the lives of billions of people around the world. While news coverage of floods, hurricanes, earthquakes or wild fires are always accompanied with spectacular images of destruction that emphasise the speed at which they strike, a myriad of slow and latent hazards have been left in the shadow of the public attention. One of those overshadowed and underestimated hazards is environmental pollution caused by persistent volcanic emissions. Our project, UNRESP, seeks to develop early-warning procedures for events during which air pollution reaches hazardous levels, using an approach that bridges volcanology, environmental sciences, history, human geography and sociology. We based our project at Masaya volcano in Nicaragua. Although Masaya has a spectacular lava lake (above video) it does not produce ash explosions, instead it quietly and persistently loads the local environment with gases and aerosol particles. This poses a huge air pollution hazard – Masaya’s annual SO2 emissions in 2006 matched those of the entire UK but were released from a point source. Masaya’s volcanic air pollution is estimated to impact at least 50,000 people in rural communities, and it is also periodically transported to the cities of Managua (population 2.2 million) and Masaya (population 150,000) where it mixes with anthropogenic air pollution. 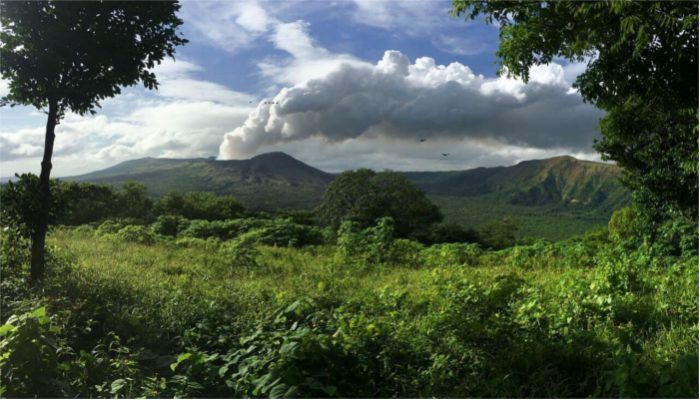 Our interdisciplinary team, composed of researchers from the UK and Nicaragua, travelled out to Masaya this year to find out how this volcano impacts local communities. This was by no means my first trip to Masaya (it was the first volcano I visited as a PhD student a decade ago). But it was the first time I was going to concentrate on the nearby communities. 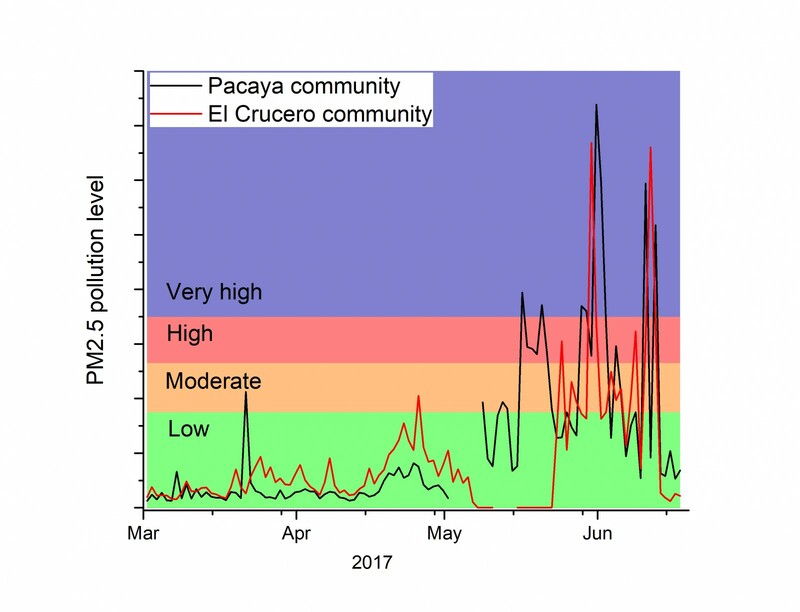 Figure 1: PM2.5 levels (daily-mean) in two communities in the vicinity of Masaya volcano, measured March – June 2017. PM2.5 pollution fluctuates greatly on short time scales and reaches ‘High’ and ‘Very high’ levels on several occasions. The air pollution index (Low, Moderate, High and Very high) is that used in the UK and is shown here for reference only as no index exists for Nicaragua. 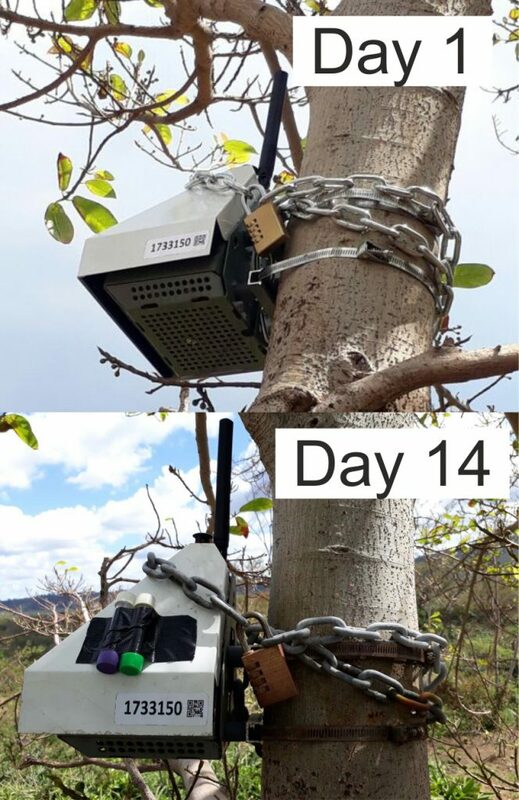 We installed a small network of air quality monitors in the communities living near Masaya. This was the first air quality network in Nicaragua as a whole! We were able to show for the first time how the volcano impacts air quality: how intense the air pollution episodes can get, how long they last and how frequently they occur – all of these are factors that impact human mortality and morbidity. We saw that the volcano particularly enhances the concentration of atmospheric particulate (PM2.5) (Figure 1). These extremely high but short-lived pollution spikes demonstrate the need for permanent monitoring and public advisories so that their impact can be mitigated. We were also interested in more than the physical side of the hazard. We went out into local communities and tried to learn what it’s like to live every day with this volcano. We unearthed and documented a huge amount of resilience practices – little things that people do to counteract the impact of the volcano on their lives. These things may seem trivial at first glance but are based on community knowledge going back centuries. 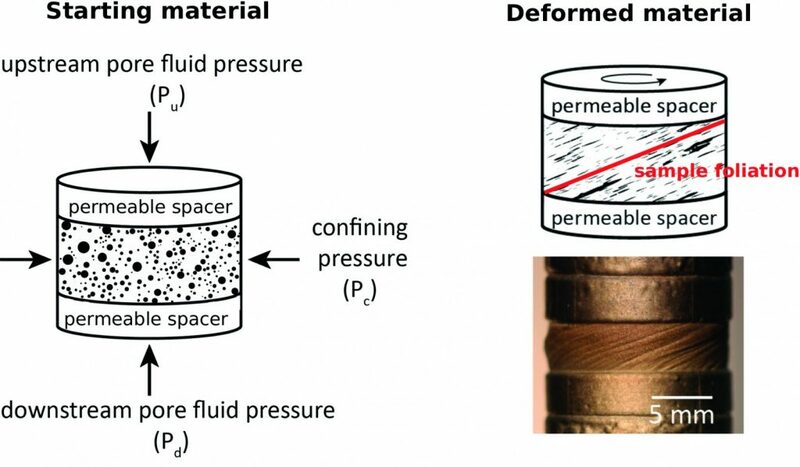 For example, the acidity of the volcanic plume causes incredibly fast rusting of metal (Figure 2) so people have learned to build houses are built without using any nails (Figure 3). Women explained how they treat their kitchen appliances in a particular way. The quality of the rain water (the acidity of which can be as low as pH 2 during the most severe pollution episodes!) is assessed by how it reacts with soap. And, perhaps most importantly, people know what kind of crops they can grow, and when. The volcanic plume is a killer to most crops (like coffee), but people have discovered that pineapple and dragon fruit grow exceptionally well. 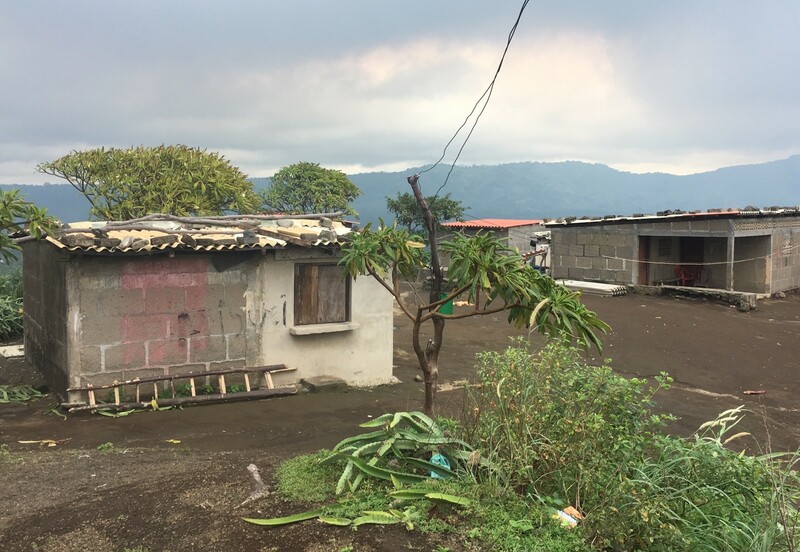 Figure 3: Houses in El Panama village, only 2 km from Masaya’s active crater. They are built without using nails due to the extremely fast corrosion. The roofs are held in place with wood and rocks. Note that the heavy ‘cloud’ overhead is the volcanic plume.This first ‘digging’ of our foundation phase has yielded more questions that it has answered. We are very keen to continue with our ongoing collaboration and expand it even further. On a more personal note, the most valuable thing I learned from this trip was something that I’ve objectively always known but never felt to the same extent before. 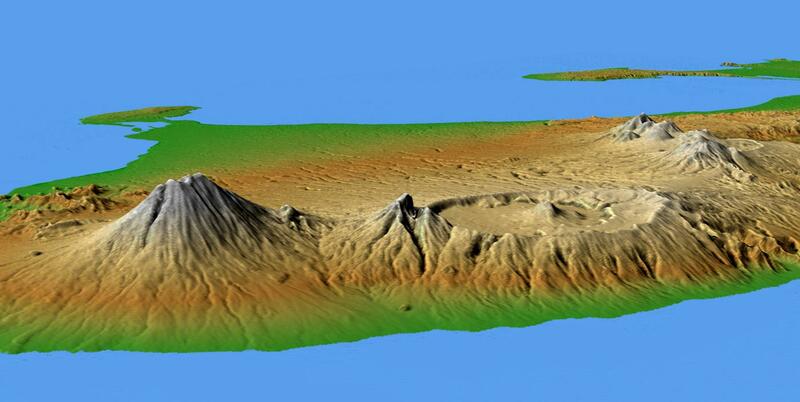 Volcanoes like Masaya are so much more than the petrology of their rocks, or the enrichment factor of their emissions, or the refractive index of their ash. They are deeply intertwined with the lives of the people around them, and to those people it’s their real life and not just a scientific publication. Let’s not ever lose sight of that. Blog written by Evgenia Ilyinskaya (University of Leeds). You can follow the project on Twitter @UNRESPproject. UNRESP project is funded by GCRF Building Resilience programme. Note all data discussed in this blog are unpublished and have not been peer-reviewed.